One of my favorite things to cook in a slow cooker is pork. There is just nothing better than a pork roast that is slow cooking all day in a delicious marinade. The pork cooks to perfection and is just melt in your mouth tender. I am always thinking of new flavors and ways to cook the pork in the slow cooker. 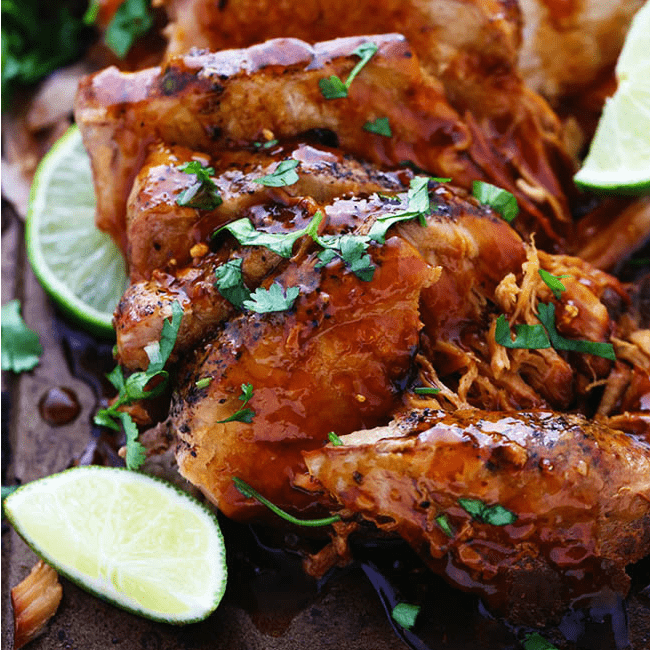 You can never go wrong with a honey, soy, garlic, and ginger infused marinade. 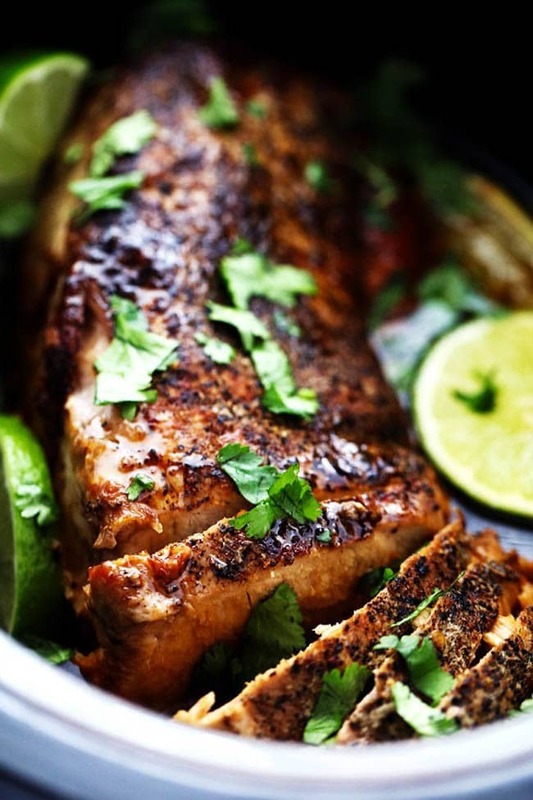 But I love adding lime to the marinade to give it that added tangy flavor. Plus the acididy helps to keep the pork tender as it cooks. One extra step that I always do before adding the pork to the slow cooker is to pan sear the outside. This only takes a few extra minutes and the result is amazing. It gives the edge a pan seared crust that seals in the flavor and gives the outside a delicious crisp edge. 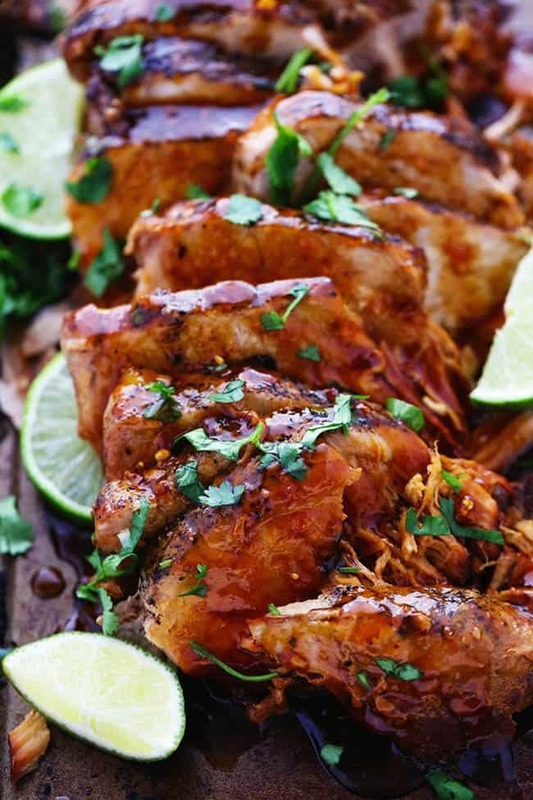 The pork slow cooks in this delicious and tangy marinade all day and the result is to die for. We loved every single thing about it from the amazing marinade to the pan seared and perfectly tender pork. In fact, we loved it SO much that we had it twice in one week! If you are looking for a delicious and flavorful meal for your family you are going to love this one. It is quick and easy to throw into the slow cooker and the result is absolutely fantastic! This is one meal that you will want to make again and again! So delicious! I always whip up a really quick red cabbage Asian slaw the morning of the day I’m going to make the pirk, and let that sit in the fridge all day. (I use however much cabbage I think will work for how many people I’m feeding and mix with rice wine vinegar, lime, sesame oil, and worchteshire sauce. 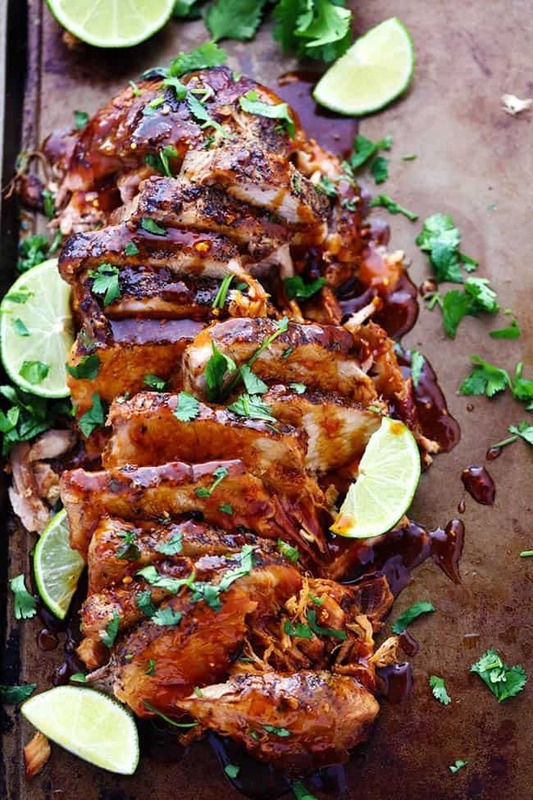 Let those flavors mingle and it’s a perfect pairing to this pork!) I’ll eat this as is, but it’s my favorite in a lettuce leaf with the cabbage, some avocado, and more lime juice and cilantro on top! HI, HAVE YOU TRIED THIS IN AN ELECTRIC PRESSURE COOKER (IP)? ID LOVE TO BE ABLE TO GET THIS DIALED IN FOR MY INSTANT POT. Do you mean a pork tenderloin when you say a pork loin? Have you tried this in a dutch oven? Do you know what the steps to adapt it might be? I haven’t yet. Let me know what you do and what is best to cook this meal. Can these be made in an Instant Pot? The pork loin here in Australia is sold with the rind on. I can’t tell from your photos if the rind is on or not. Would you leave it on? Thanks. Followed the instructions precisely, except my loin was only 1.30 pounds so I adjusted the measurements a tad. Left in the crockpot for an hour longer, and then let it sit in stay warm mode for about another hour. OMG GUYS… delicious. The hubby and I thought it would taste great on a bouquet with Muenster cheese.. orgasmic. This is seriously delicious! Would be great as pork sliders too. I made this twice before in a crock pot and thought it was good. Tonight I used my instant pot and was truly blown away. I doubled the marinade as I only had a large pork roast. I cut the roast in half, seasoned, and browned the pork. I used a bit of white wine to deglaze then put the pork back in. I cooked it on high for 1 hour and did a quick release (careful to start release slow to prevent liquid from splashing out). I removed the pork and shredded it, thickened the marinade right in the pot, and put the pork back in the sauce. Amazing! Am I reading the recipe correctly, does it say to cook on low for 6-8 and then on high for 4-6 for a TOTAL of 10-14 hrs????? It is either/or. You can either cook it on low for 6-8 hours or cook it on high 4-6 hours. I enjoyed this recipe. It was worth making. However, keep an eye on it. I was concerned the honey would get sticky and burn in the Crock-Pot. It didn’t, and made a nice juice, but next time I went back, hardly any sauce was left and it was starting to burn on high. It looked for 5 hours on a mix of low and high, but dried out, so could have come out sooner. Pork cooks down, but so does the sauce. I made the full recipe for sauce with only a 1 lb pork loin and that was perfect. Follow the recipes online to mix corn starch with cold water first. If you just put corn starch in a hot/boiling sauce, it will clump. I’d like to figure out a modification to make the sauce taste more like honey, ginger and lime than the soy sauce saltiness which overpowered, even tho I used reduced sodium. That may be due to the overcooking. Overall, was tasty and worth it and I will try modifications next time.